The Rev. Dr. William J. Barber II, president of the North Carolina NAACP and architect of the Moral Monday protest movement, will give the keynote address at Candler School of Theology’s Bandy Preaching Conference at 7 p.m. Thursday, March 23, in Emory University’s Glenn Memorial Auditorium. Barber’s address is part of “Preaching a Relevant Word: Politics, Policy & the People,” scheduled March 23-24, a conference designed to help pastors and congregants better understand contemporary sociopolitical issues and provide strategies to address them through proclamation. The conference will feature workshops, worship and a closing plenary on March 24. The keynote by Barber and conference are free and open to the public, but registration is required. Guests may register for the keynote alone or the full conference. Register here. Bandy Professor of Preaching Teresa L. Fry Brown says that the conference theme was conceived in response to questions from pastors, seminary students and congregations across the U.S. regarding the necessity, delivery and efficacy of 21st-century prophetic preaching — questions that Barber is well-suited to address. 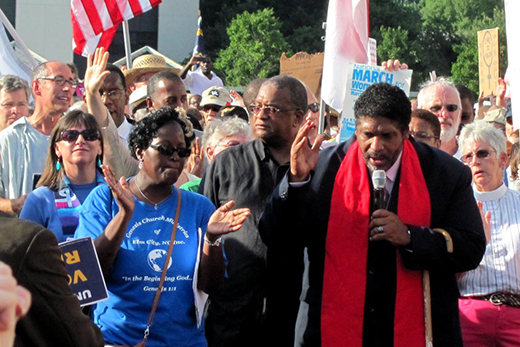 Barber’s Forward Together Moral Movement gained national acclaim with its Moral Monday protests at the North Carolina General Assembly in 2013. These weekly actions drew tens of thousands of North Carolinians and other moral witnesses to the state legislature. More than 1,050 peaceful protesters were arrested, handcuffed and jailed, bringing attention to the actions of the legislature. A highly sought after speaker, Barber has keynoted hundreds of national and state conferences, including the 2016 Democratic National Convention. He has served as president of the North Carolina NAACP, the largest state conference in the South, since 2006 and sits on the National NAACP Board of Directors. He is known as one of the nation’s foremost public theologians and is regularly featured in media outlets such as MSNBC, CNN, the New York Times, the Washington Post and the Nation Magazine. Along with Barber’s keynote, the conference will include worship services with sermons by the Rev. Emily Michelle Ledder 10T 19G of the United Methodist Church’s General Commission on Religion and Race and the Rev. Billy Honor 10T of Atlanta’s Pulse Church, plus a closing plenary with the Rev. Dr. Ted A. Smith 04G, associate professor of preaching and ethics at Candler. Conference attendees will also have the opportunity to attend one of four workshops Friday morning: ministry in a digital age, transformative worship liturgies, using social media to enhance preaching, or the sermon as a liturgical event. Workshops will be led by doctoral students in homiletics, an element Fry Brown believes is necessary for such a forward-looking conference. “It is imperative that any 21st-century preaching conference include the voices and perspectives of those who will shape the disciplines of homiletics and liturgy over the next decades,” she says. The conference is made possible through Candler’s Bandy Chair in Preaching. The Bandy Chair was created in 1986 with a gift from Mr. B. Jackson Bandy, and is considered by many to be the premier chair in homiletics in the country. A book signing will follow the address. The Bandy Preaching Conference is free and open to the public, but registration is required. Register here.